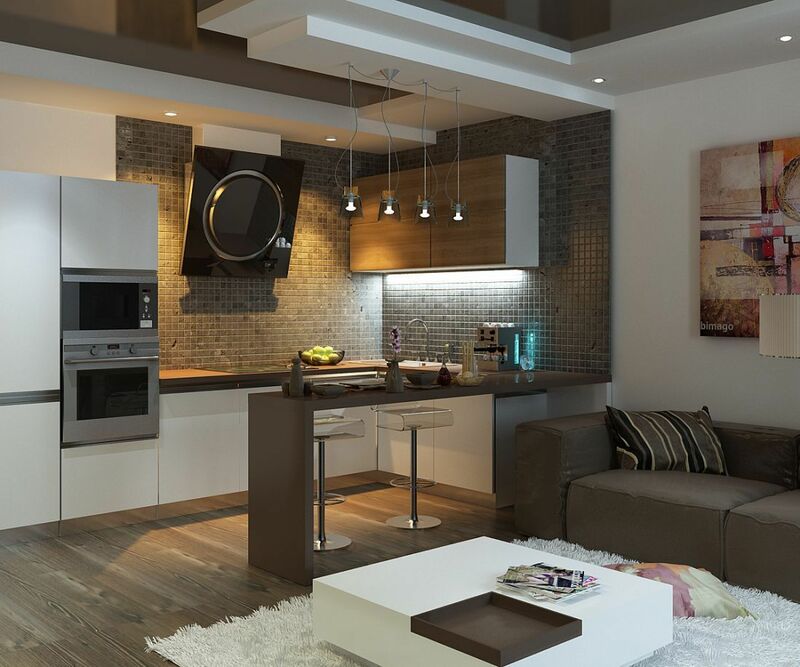 In contrast to small and standard apartments, where you have to economize virtually every square meter, owners of a private home can use any design techniques that meet their perceptions of the beauty, functionality and practicality of the home interior. In spacious rooms of private apartments, you can realize your design dreams, creating a truly comfortable, cozy and externally attractive design for a family nest. But large spaces are also a big responsibility. It is important not to miss the chosen concept for creating a design for private homeownership, not to be carried away from the spaciousness of the premises and the opportunities that a large area provides. We bring to your attention an extensive selection of design projects of private houses with the design of rooms of different functional purposes. And we hope that the actual private house interior decoration ideas, style features 2017 for creating a modern, practical and aesthetic interior will help you to implement the renovation of your dreams and enjoy the fruits of your own design ideas. Often to fill available volume of the room with the maximum amount of light, you have to abandon the textile design of windows (if they do not open to the street, then such a measure does not mar the household design concept). Not a new, but still relevant design method is the use of natural motifs in the design of the home. And it’s not just about using natural materials for creating of decoration and furnishing, decorative elements and textile design. The use of a natural color palette allows creating a comfortable, cozy and relaxing atmosphere of the home, in which it is so pleasant to relax from a gray and noisy city, a lot of advertising billboards and depressing illuminations. In private houses with two or more floors, small functional segments can be arranged on the staircases – home mini-offices or places for reading with bookshelves and comfortable chairs, floor lamps. 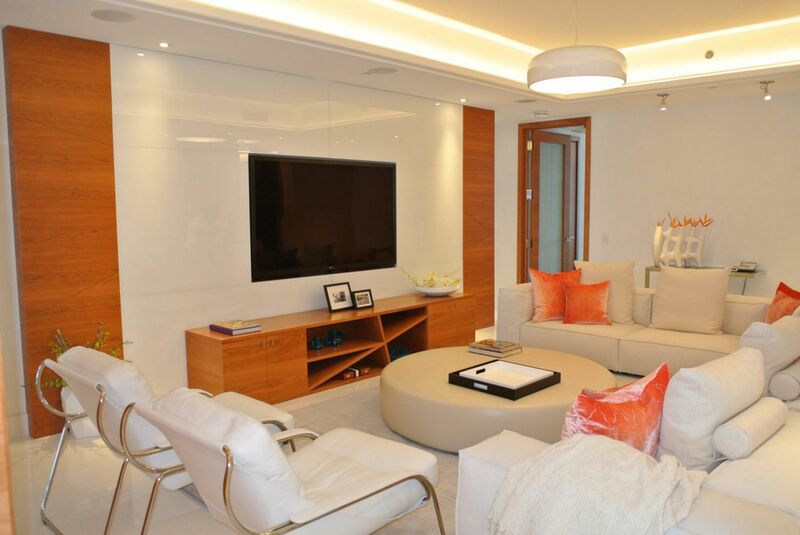 When designing modern private apartments, all the shades of white are often used. Not only the possibility of visual increase in the volume of premises pushes designers and their customers to apply a white tone for finishing and furnishing. The creation of a light, airy and bright image of the functional space is not in the last line. In this case, there are no restrictions on the choice of optional accessories for premises – white is eligible for designing kitchens, living rooms, bedrooms, bathrooms and even ancillary spaces (corridors, hallways, verandas). The second most popular color for the design of modern homes is still gray and its shades as it is for a long time being. The neutrality, versatility and simplicity of the combinations it creates is pushing many people for the application of shades of gray as a basis for interior decoration, as well as for the execution of main furnishings and additional interior items. A simple combination of gray shades with white color and the integration of wooden surfaces (of any kind of wood) are able to create not only just comfortable environment of the room, but also bring a touch of nobility and elegance into the image of the space. If we talk about choice of a color palette for designing of private apartments, then it`s obvious that it is much wider for spacious rooms. 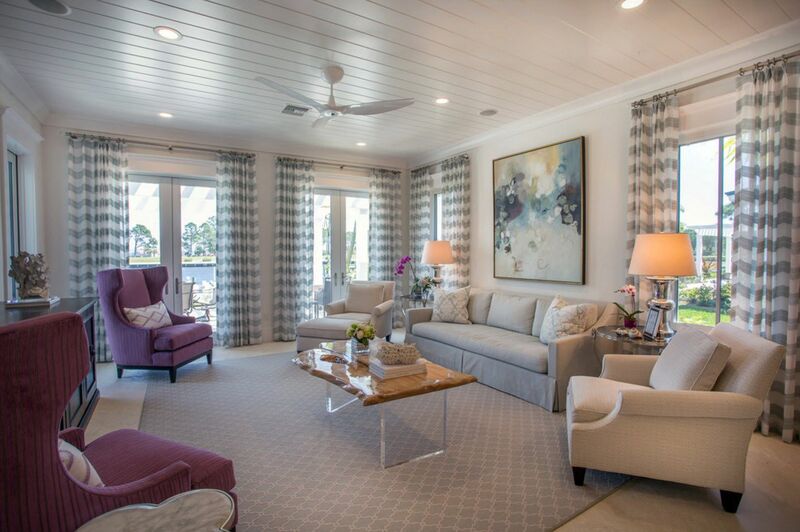 Bright space is able to take quite bright accents. 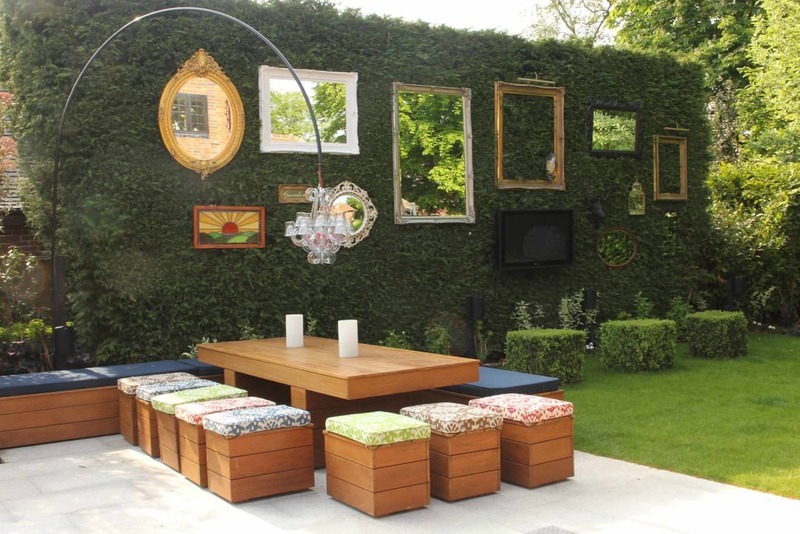 It can be both separate interior items (upholstery of furniture or storage system facades), and entire surfaces used as accent, attracting all attention to themselves. Another feature of finishing the premises in private homes is the use of industrial motives. It is quite original in a country house, for example, to see concrete or brick walls as accents for finishing a bedroom or living room, kitchen or dining room. It can be either raw treated surfaces (real brickwork or concrete wall) or spectacular imitations made with liquid wallpaper, wall tiles or decorative plasters. The Scandinavian stylistics had no less influence on the formation of a modern style of living quarters’ decorating. Designers all over the world offer their customers the motives of the Nordic countries as the basis for decorating bedrooms and living rooms, kitchens and utilitarian spaces. Simplicity and laconicism, mixed with comfort and coziness, mixed up with simple color combinations and the opportunity to purchase interior items at affordable prices in a network of well-known stores, pushes many clients to choose this, with no doubt, practical stylistics for decorating their homes. 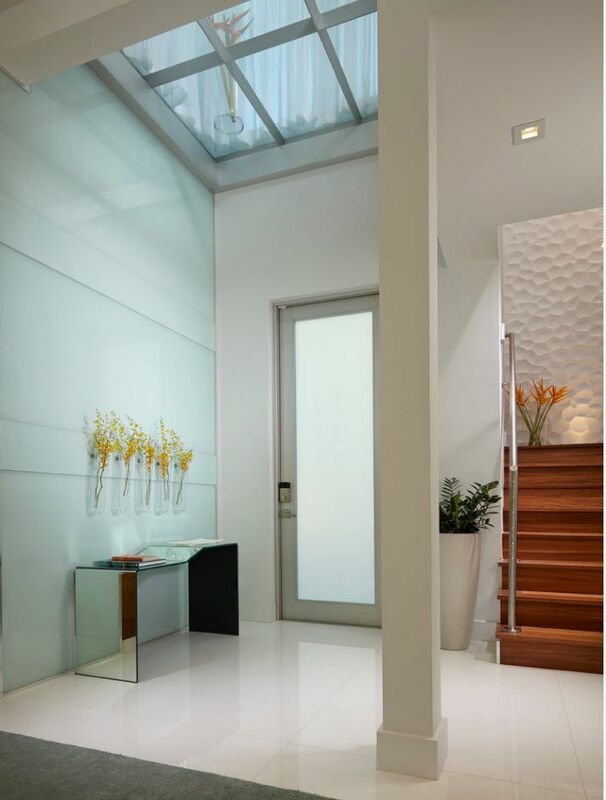 Particular attention in the interior of modern private homes is given to the lighting system. Obviously, a step-lighting system is required in spacious and multifunctional premises. A central luminaire or lighting around the perimeter of the room will not be enough. If there are several residential segments in the room, it is necessary to choose the lighting option for each zone (depending on the functional, the size of the zone and the location relative to the window openings) – spotlights or LED strip lighting. Another characteristic feature of the design of modern dwellings became the use of multifunctional interior items and transforming furniture. For example, beds and sofas with storage pockets, folding tables, consoles that can take up nix of space in the folded version, pouffes and ottomans, inside of which you can store books and magazines; kitchen corners with boxes for placing all kinds of utensils; built-in storage systems, which often literally merge with the walls. Living room in a private house is most often a spacious and bright room, where gathers not only the whole family in the evenings, but also it is possible to receive guests, organize parties. The room should meet all the functional requirements of the family, the preferences of the household, and their ideas of organizing recreation. But at the same time, the interior of the living room should effectively serve as a home hallmark, as it is in this room invited guests spend most of the time. The living room in a private house is comfortable and cozy, but modern and practical. It is in the living room the influence of modern stylistics, advocating for “comfortable minimalism,” is felt as in no other room of a private home. Spaces of private houses allow you to furnish living rooms with a special luxury, literally fill almost the entire volume of the room with interior items. But this season designers recommend not just restrain ourselves in decorating of the living room, but to clearly define the list of necessary furniture items and use functional items as decorative items – only lamps, textiles and wall decor in rare cases. As a result, the living room spaces will be filled with light and air, the interior will not clutter it, resulting into not only organic environment, but a favorable emotional background for relaxation and recreation with the family. The opposite strategy of decorating the living room in a private house represents the traditions of classical stylistics. If the classic interior in modern design projects cannot be met often in the “genuine” form, then the neo-classic is common everywhere. Adapted to the needs of the modern homeowner, traditional motives take on a second life, thanks to progressive findings in the field of finishing materials, the production of furniture and decorative elements, textiles and lighting fixtures. The so-called “affordable classic” becomes the best option for decorating rooms in private apartments, the owners of which want to see elegance, an easy hint of luxury and functionality of the interior at the same time. Living room in a private house is difficult to imagine without a fireplace. There is always the possibility of installing not just an electrical analogue of the hearth, but an operating fireplace with a chimney in your own house. Nothing is so capable of creating a truly comfortable and cozy environment for relaxation in the family circle as a dance of fire in a beautiful fireplace. 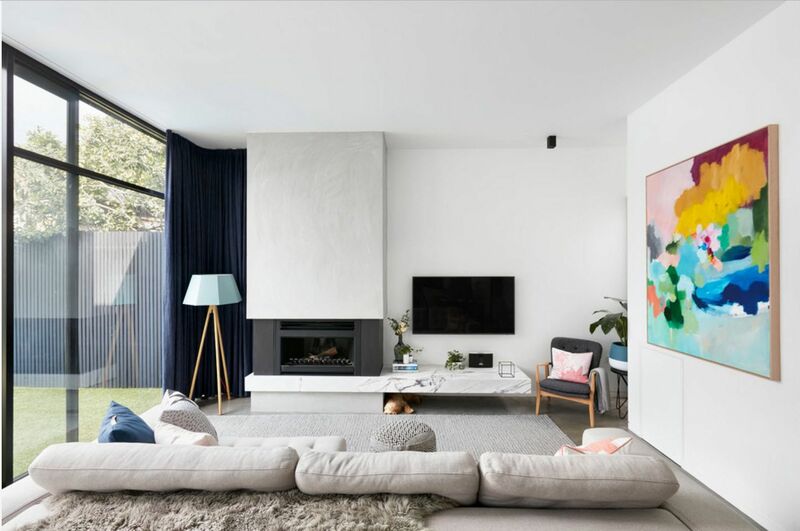 The hearth in the modern living room, following many years of tradition, becomes the focal point around which the entire furnishing of the room is built. Often the hearth becomes the starting point for creating a balanced living room image. The bedroom of a private home ownership is a private room, designed solely on the grounds of personal preferences of the owners. It is not without purpose modern stylistics propagates a reasonable minimalism combined with maximum personal comfort. 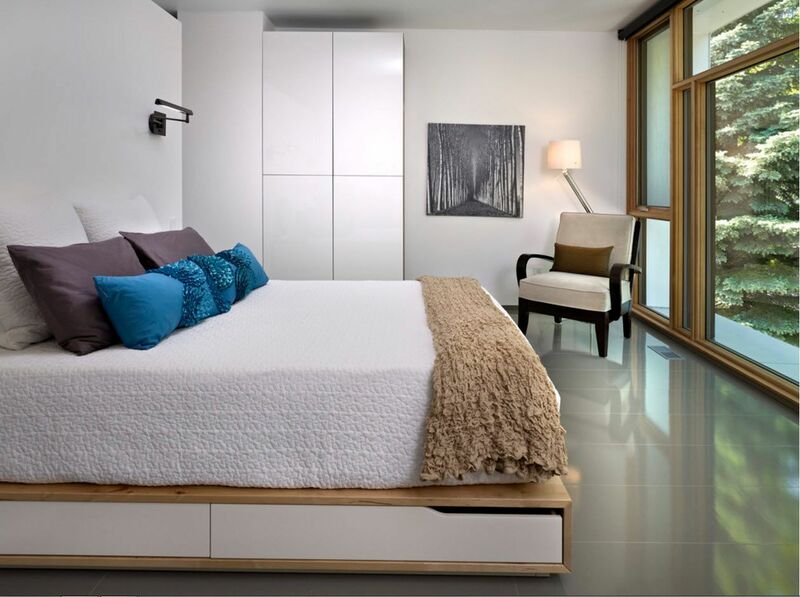 If it is more convenient for you to have only the necessary interior items in the bedroom space – a bed, a wardrobe closet and a bedside table or a cabinet, then it is necessary to organize the situation of the room. 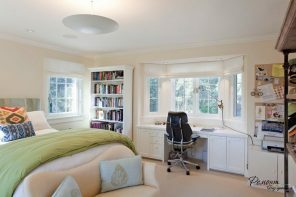 If the bedroom does not seem to be fully functional without a dressing table, a workplace or a cozy reading corner, and space allows organizing additional functional segments, then these zones can be successfully integrated into the existing interior. The bedroom is perhaps the most popular room in terms of using beige palette. The warmth and tranquility, pacification and comfort, which give beige shades as best suited for the room, where it is customary to rest after a day’s work and gain strength before new achievements. Beige palette of decoration can be effectively diluted with snow-white furniture. Or create a certain emphasis with the help of a dark color solution for the bed, and storage systems. For many people, the cuisine is the heart of the house, its functional and emotional hearth, the center of attraction. 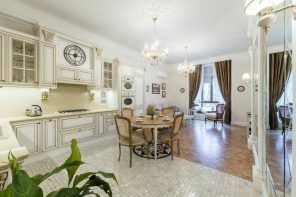 Not only because the hostess spends a lot of time cooking delicious dishes, and the whole family gathers for meals in the evenings, but also because the closest guests are often taken in the kitchen. 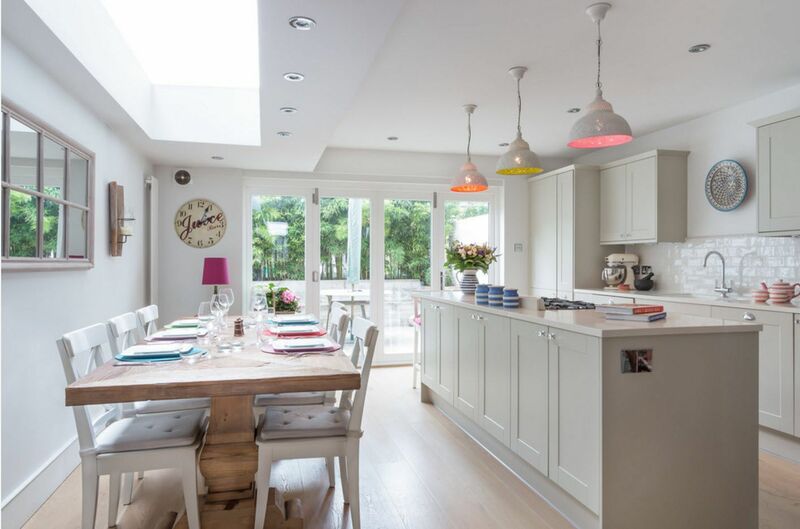 As a rule, the kitchen space of a private house can boast a sufficient area for the arrangement of all necessary storage systems, appliances, work surfaces and a dining area. In a spacious kitchen, you can skip saving every centimeter of space, use household appliances of standard sizes and clearly fulfill the ergonomic requirements for comfortable and safe holding of all working kitchen processes. 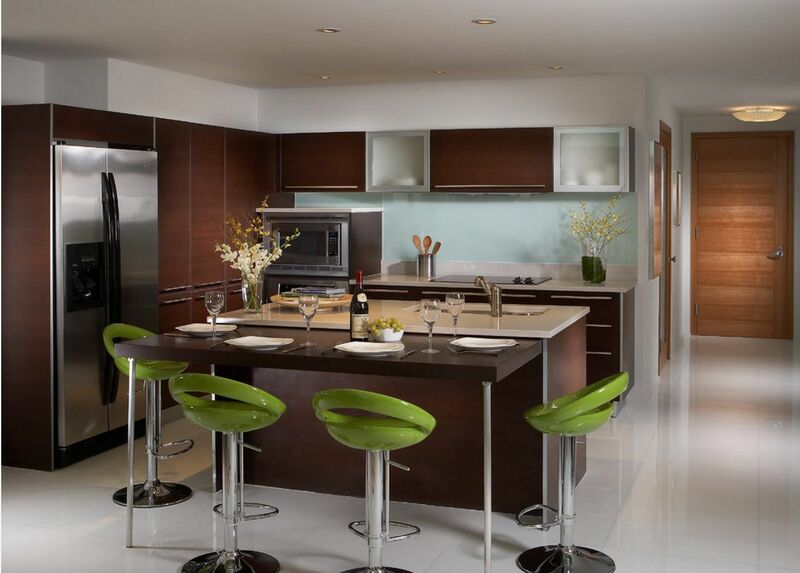 The advantage of spacious kitchen facilities is that you can use popular color solutions. For example, contrasting combinations in the execution of the facades of kitchen cabinets. 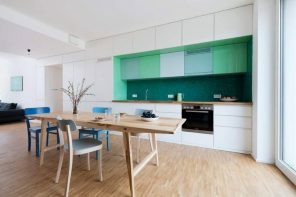 Nobody will argue with the fact that the color palette of the kitchen interior largely depends on the choice of shades for the performance of the furniture set, because it occupies a large part of the useful space. The dark facades on the light background of the kitchen space decoration look very impressive, promoting respectability and chic of the interior. And the use of a dark tone for the execution of the lower tier of cabinets in combination with a light tint of hinged storage systems allows you to visually increase the height of the room. Distinctive features of the bathroom, located in private apartments, are comparatively large area (in comparison with the premises of standard and small-sized apartments), the possible presence of a window and the non-standard arrangement of communication systems. In a private house, you can move water pipes at your discretion, organize a forced exhausting system. 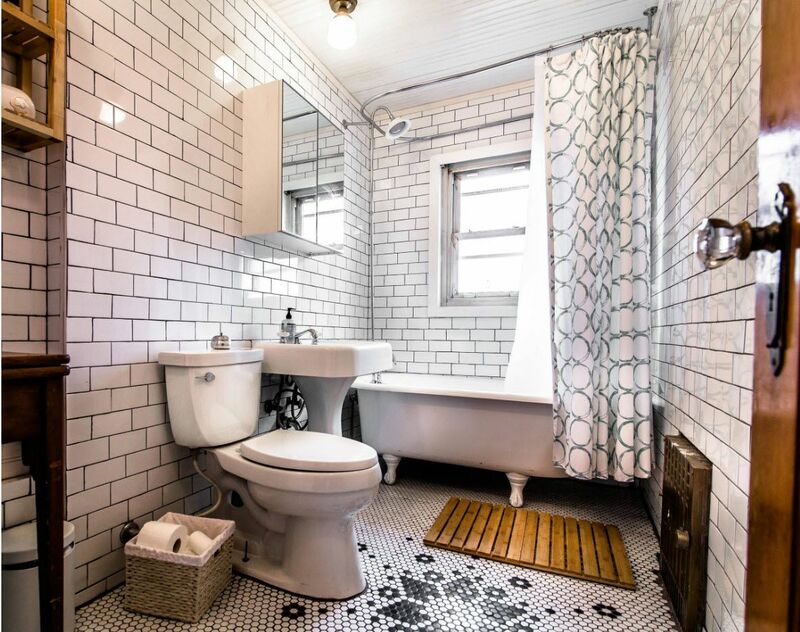 In a word, simplify the functionality of the bathroom without coordinating your actions with various architectural bureaus. 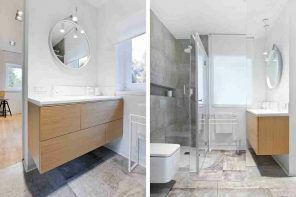 All these advantages make it possible to make a practical, comfortable, functional and at the same time beautiful interior of the bathroom with the least expenditure of resources and time. In the bathroom of a private house, you won’t limit yourself to a standard set of sanitary ware. In addition to the bathtub, you can install a shower cabin, because in most families there is necessarily a separation for those who prefer to bask in hot foam and those who prefer a contrast shower, hydromassage. In a utility room where there is no need to save every centimeter, you can install a double sink and significantly reduce the time for a morning toilet not only for large families, but also for married couples. In addition to the toilet, you can install a bidet and use original designer variants of plumbing devices instead compact models. The hallway in a standard apartment is usually a narrow and dark room with several doorways (leading to other rooms in the dwelling) or a passage to the corridor. There is simply nowhere to pass apart in such a space from the point of view of implementing their design ideas. Contrasting situation is to have deal with rather spacious utilitarian spaces of private houses – no one will specifically plan the construction of a dwelling with a small hallway or a very narrow corridor. 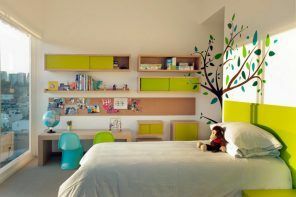 In such premises, it is possible not only to limit themselves to a light color scheme (in particular, if there is a window in the hallway or corridor), and the choice of furniture both as storage systems is much larger.